Dr. Smith experience as a chiropractic patient inspired him to become the chiropractor he is today. Dr. Smith. began his pre-chiropractic education at the University of Alabama at Birmingham where he received his degree in Exercise Science. He was then accepted into Texas Chiropractic College in Houston, Texas. Upon graduation in 2003, Dr. Smith. returned to the Birmingham area to begin his practice. Dr. Smith. is married to Je Anne and they have two children. He enjoys hunting, fishing, college football and his time with his family. He serves as the President of the Birmingham Area Chiropractic Society, member of the Board of Directors for the South Shelby Chamber of Commerce, and is a graduate of the Leadership Shelby County program. He is a member of the Alabama State Chiropractic Association where he serves as a Governmental Affairs committee member and as the Medicare representative for chiropractors for the state of Alabama. 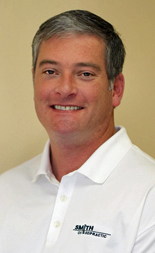 He also serves as the Alabama Local Liaison for the American Chiropractic Association. Thank you for getting to know us and we look forward to meeting you in person and getting to know your specific chiropractic needs. Give our Chelsea chiropractic office a call or email me using the “Email the Doctor” button at the bottom of every page. Chiropractic Care and Spinal Decompression for Chelsea, Inverness & Columbiana.